Exchange Buildings and the Nelson Monument, c.1832. Begun in 1803, exchange Buildings was completed in 6 years. 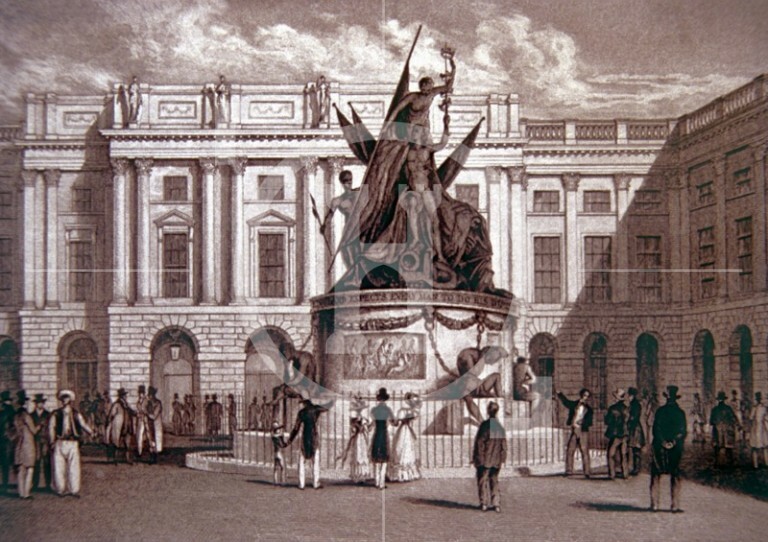 The 22 ton Nelson Monument was erected on Exchange Flags in 1812. The total cost for the building of this magnificent structure, the great architectural ornament of Liverpool, and the finest commercial building in the empire, was £110,848. An Electric Telegraph opened in Exchange Buildings in October 1847. In 1866, the first public message of a commercial character transmitted by the Atlantic Telegraph was posted on the slate of the Exchange News-room. It was as follows :- 'Palmyra, screw-steamer, hence at New York yesterday Aug.1'. Dr.Livingstone, the celebrated African traveller and missionary, visited Liverpool, on October 12 1857 and on the following day addressed a meeting of merchants and others, in the Cotton Sales-room, Exchange Buildings.